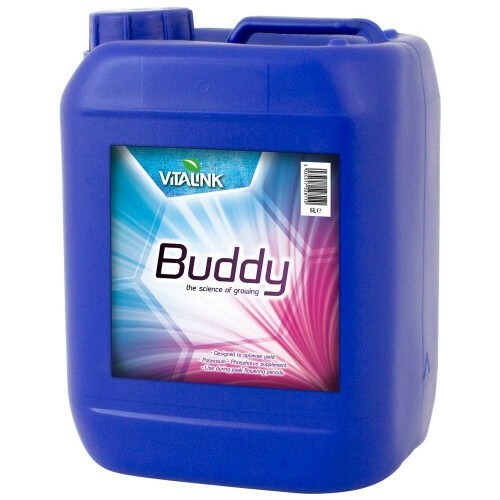 VitaLink Buddy is a powerful additive to any nutritional hydroponic gardening environment that gives optimum levels of PK or Potassium and Phosphorous to help promote better yields from plants. VitaLink Buddy also contains the needed Magnesium and Sulphur to help boost the PK power to yield larger buds to grow more fruits and flowers faster. By adding VitaLink Buddy during week 3 to 8, you create more uptake of the PK into the roots and by increasing the ratio of Potassium to Nitrogen propelling the plants reproductive process to utilize more energy in creating more flowers and fruits which will naturally increase the yields. The plants health will improve and will be able to provide higher quality buds of greater size and in large quantities. 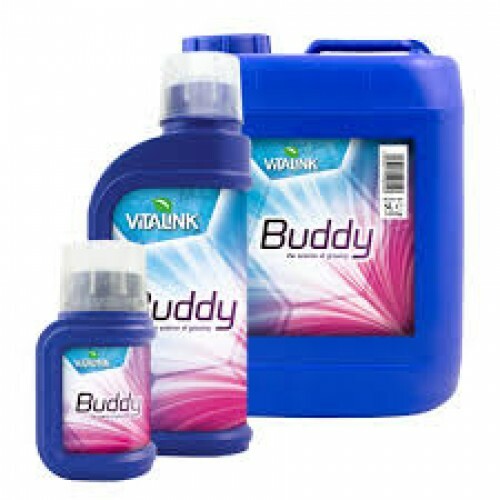 VitaLink Buddy has Potassium to Phosphorous ratio of 3.5 to 6 respectively and gives a huge productivity boost during all phases of budding and flowering. Extensive scientific research has gone into the development of VitaLink Buddy to allow many benefits during hydroponic gardening. Lower concentration of PK to allow for longer periods of use from budding week 3 to fruition or flower week 8. VitaLink Buddy was designed to be used with a powerful nutrient supplement, PK, which will give more nutrients to the plant during stressful peak blooming phase. During week 5 or 6 use PK for one week then go back to VitaLink Buddy to help sustain the naturally overproduction of larger more hearty buds, flowers and fruits. If you desire the utmost professional guidance on hydroponic gardening, Grow World offers the best in class, highly skilled hydroponic technicians available. They guide you through all the products available to give you the highest quality, healthiest plants that produce higher quality yields. Grow World is a leading hydroponic retailer who works with manufacturers of hydroponic equipment and products to give you the best price and top of the line products. Grow World provides excellent customer service and is one of the leading hydroponic growing essential retailer in the UK. Throughout the flowering and budding phases during weeks 3 to 8 using 1ml per 1Litre of water will give the plant the power it needs to develop healthy quality yields. VitaLink Hydro Max Bloom Soft WaterVitaLink Hydro Max Bloom Soft Water contains all the essential nu..
Vitalink Coir Max A&B Soft Water VitaLink Coir Max A&B Soft Water is a coco coir nutrie..